The AFL footy season is finally upon us. With the pre-season noise now a mere whimper, the real stuff begins. Who’ll get off to the best possible start in Round 1? History: Played 219: Carlton 125 v Richmond 92 (two draws). Last Meeting: MCG, round one, 2018: Richmond 17.19 (121) defeated Carlton 15.5 (95). Final Thoughts: A 90,000+ crowd is set to pack the ‘G for the traditional season opener. Carlton got the jump on the Tigers last year, blazing to a five goal lead. But class eventually shone through for Damien Hardwick’s side, who this year are desperate to atone for their preliminary final capitulation last September at the same ground. With Tom Lynch set to play his first game, it’s all systems go for the yellow and black. Expect the Blues to come out firing, however. With a longer (and fairly impressive) pre-season behind them, there’s no excuse for Brendon Bolton’s young troops to not give this one a red hot crack. History: Played 232: Collingwood 132 v Geelong 99 (1 draw). Last Meeting: MCG, round eight, 2018: Collingwood 5.15 (45) lost to Geelong 9.12 (66). Final Thoughts: Perhaps the most intriguing matchup of Round 1. With the AFL’s toughest draw to start the season (including Richmond and West Coast in rounds two and three) the Pies will be desperate to pick up their first four points of the year. With Jamie Elliott returning to an already dangerous Collingwood forward line, the Cats will have their work cut out. How Chris Scott’s side fares will tell us a lot about what’s to come this AFL season. With an ageing list, could it be now or never for the Cats? Gary Ablett’s foray into the forward line will be an interesting watch. History: Played 33: Melbourne 13 v Port Adelaide 20. Last Meeting: Adelaide Oval, round 14, 2018: Port Adelaide 11.9 (75) defeated Melbourne 9.11 (65). Final Thoughts: Another side who is expected to feature heavily come September is Melbourne. After a 2018 season that injected a wave of joy back into the club, Simon Goodwin’s side are primed to go bang. And having beaten Port Adelaide eight of the last ten times at the MCG, they go into the season opener with confidence. For Port, they will need to limit the influence of Max Gawn and Melbourne midfield guns in and around the contest. New recruit Scott Lycett and Paddy Ryder loom as a imposing duo in the ruck. History: Played 41: Adelaide 19 v Hawthorn 22. Last Meeting: MCG, round 13, 2018: Hawthorn 12.16 (88) beat Adelaide 4.8 (32). Final Thoughts: Another intriguing clash to kick off the AFL season, with two sides who remain difficult to read. The Hawks, as usual, were busy in the trade period, with Alastair Clarkson bringing in Chad Wingard and Tom Scully. But those two, plus Brownlow medalist Tom Mitchell (out for season) and Grant Birchall will be missing in Adelaide. While Hawthorn sides under Clarkson are typically well-drilled, this Adelaide side might prove a step too high. The Crows, after a disastrous 2018 campaign, are champing at the bit to return to the field. And by all reports, their list is in tremendous shape. And after nine losses in their last 10 against the Hawks, this one holds that little bit of extra spice. History: Played 160: Western Bulldogs 81 v Sydney 78 (1 draw). Last Meeting: Marvel Stadium, round four, 2018: Western Bulldogs 11.13 (79) lost to Sydney 13.8 (86). Final Thoughts: The Swans, yet again, have been written off by the ‘experts’. Many of these claim the Bloods can’t make the top eight this AFL season. But with 16 finals appearances in the last 17 seasons, coach John Longmire couldn’t care less. And with almost a full squad to pick from, the Swans go to Marvel Stadium full of confidence. On the contrary the Bulldogs – having endured two difficult seasons after their 2016 Grand Final triumph over the Swans – go into Round 1 with several key outs. Jason Johanissen, Tom Boyd, Liam Picken and now Dale Morris will all miss for varying reasons. Premiership star Tom Liberatore, however, returns in a much-needed inclusion. History: Played 32: Brisbane 10 v West Coast 22. Last Meeting: The Gabba, round 23, 2018: West Coast 14.14 (98) defeated Brisbane 11.6 (72). Final Thoughts: The 2018 Premiers return to the AFL arena with a long away trip to Brisbane. West Coast were outstanding during last September, timing their run perfectly to take home their first flag since 2006. The question, as always for those on the back of a premiership win, is whether they can back it up. At least in the short term, this fixture gives them hope. Having not lost to Brisbane since 2012, recent form is on their side. The Lions, however, have impressed many since Chris Fagan has taken the reins. A young side with plenty of promise, they’ll be desperate to show everyone why they’ve been rated so highly. History: Played 11: St Kilda 7 v Gold Coast 4. Last Meeting: Metricon Stadium, round 13, 2018: Gold Coast 11.12 (78) lost to St Kilda 11.14 (80). History: Played 8: GWS 3 v Essendon 5. Last Meeting: Sydney Showground Stadium, round 10, 2018: GWS 8.12 (60) lost to Essendon 14.11 (95). Final Thoughts: Another clash that looms as an excellent early marker for two sides with September ambitions. With games against West Coast, Richmond and Geelong to come, the Giants will be putting heavy importance on this clash at home. Despite an off-season where they lost top-end talent in Dylan Shiel, Tom Scully and Rory Lobb, Leon Cameron still possesses a prodigiously talented list. As always, consistency will be their key issue in 2019. The Bombers had a lacklustre JLT campaign and with the news that they may miss Joe Daniher for another month, new emanating from Windy Hill hasn’t been overly positive. Nevertheless, a win in Shiel’s first game (and first against his old club) will position them well considering their (contrasting) easier early-season draw. History: Played 30: Fremantle 12 v North Melbourne 18. Last Meeting: Optus Stadium, round 10, 2018: Fremantle 8.10 (58) lost to North Melbourne 12.14 (86). 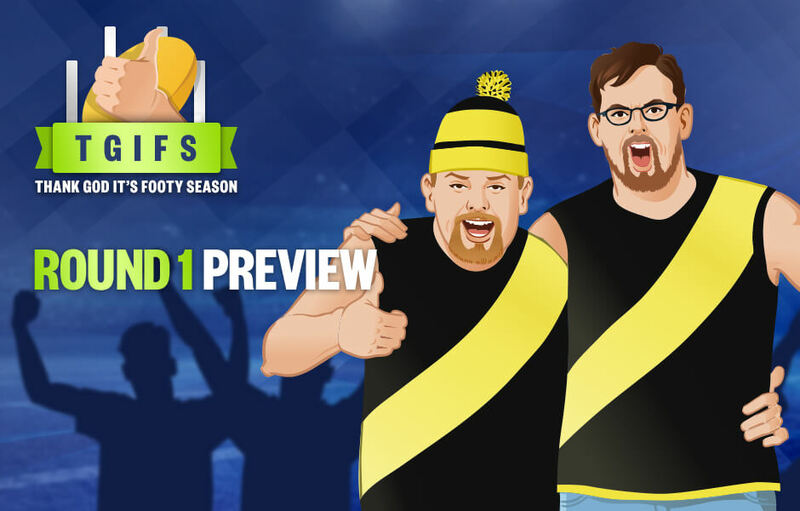 Final Thoughts: With Gold Coast and St Kilda to come in rounds two and three, a round one win for Freo will position them for a perfect start to 2019. News this week of Jesse Hogan’s struggles may have soured things slightly, but a fit-again Nat Fyfe will get Dockers fans excited. After three seasons without finals footy, time is running out for Ross Lyon. Another failed year would likely stretch an already-patient board. For the Roos, 2018 was a surprisingly strong season despite just failing to make the finals. Their last trip to Optus Stadium, Round 10 last year, was a fruitful one, running out 28-point winners over the Dockers. Can they repeat the dose?